I often marvel that I was able to get through the first 35 years of my life without owning a cell phone. Mind you, these amazing communication devices were neither widely available nor affordable until then. My first handset was bulky, expensive and only good for making calls. Today, I use my smartphone so much it’s essential to be on the lowest price rate plan I can find (while still giving me the coverage and service I need). This can add up to a nice chunk of change when you factor in an entire family. Which brings me to my daughter. She’s a good kid: she’s really conscious of the fact that we’re not made of money. She’s been carrying around the same basic mobile phone since middle school, and it doesn’t do a lot more than that clunky old phone I bought 20 years ago. She can make calls and text. That’s it. 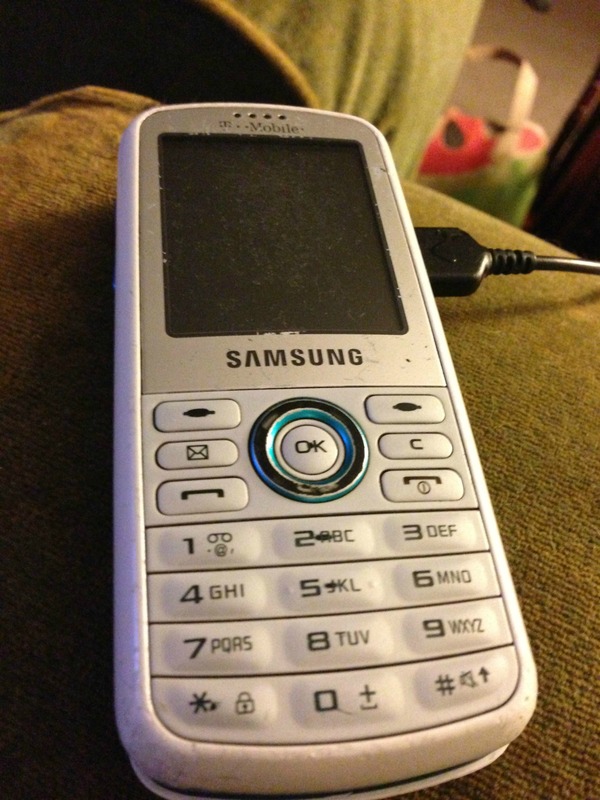 This is my daughter’s five-year-old, not-so-smart phone. I had wanted to replace it for a while. She’s ridiculously responsible and has proven she has the maturity to handle having easy access to the Internet — but she has always insisted that she was fine with the phone she had, and to be honest, I let it drop because I wasn’t too keen on adding yet another data account to our family plan. But it’s getting to the point where carrying around a “dumbphone” is — well, dumb. She borrowed my car a lot over the summer so she could visit friends — and since she goes to a magnet school, those friends are scattered all over the Valley… and she often once got lost, which had me wishing she had a smartphone with Google Maps, which now includes excellent turn-by-turn navigation. When she receives a check, I often end up having to make the deposit for her because she doesn’t have the time. It would be so much easier for her to use one of those banking apps were deposits were as simple as taking a photo of the check with your phone. Having a smartphone in your pocket means you also have a notebook, calculator, calendar, camera, voice recorder and more, at your fingertips. She wasn’t interested. All I could do was wait it out. She’s had that phone for five years — nothing electronic lasts that long, right? So I’ve been on cell phone death watch — until this week, when the folks at #cbias Social Fabric gave me the opportunity to try out a new MyTouch Android smartphone through Walmart’s Family Mobile service. Walmart offers its own cell phone service? Who knew? And how could I be sure that the quality of the service was any good? Those quality questions were put to rest when I learned that Walmart Family Mobile uses the 3G network from T-Mobile, which has been our family’s cell carrier for the last ten years. They have always given us good coverage in our neighborhood and in most of the areas we frequent here in Los Angeles. And when I’ve compared the cost of their wireless plans, I’ve always felt reassured that we would have a hard time finding anything cheaper. But a cheap wireless plan from Walmart could be a game changer. I decided to do a little research. 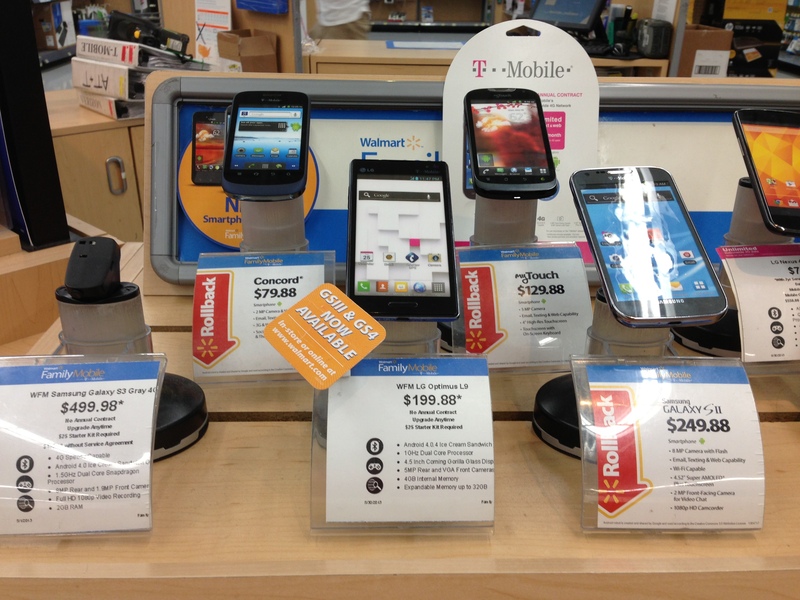 Some of the phones offered by Walmart Family Mobile. We currently pay just under $140 per month for our family’s three phones. This breaks down to $80 for talk and text for all three handsets, plus $10 per month for unlimited data on the two smartphones my husband and I use. Additionally, we are making payments of $20 per month for my Apple iPhone, acquired a few months ago. The rest is for fees and taxes. Adding another smartphone line to our plan will cost an additional $10 per month plus the cost of the phone. The myTouch model for sale at T-Mobile stores is $264. If I choose, I could pay for it over time at $20 a month for 24 months. Let’s say that’s what I do: This will make my monthly bill go up to $170 per month. Our local Walmart carries a different version of the myTouch phone. The ones at T-Mobile have a slide-out keyboard, and the ones at Walmart do not. But the Walmart phones are just $129.88 right now, which is half the price. New customers also need to purchase a $25 starter kit to activate each line (this is a one-time fee). The monthly cost for the first line is $29.88, if all you want is unlimited talk and text, and $39.88 for unlimited talk, text and web. Less than $40 a month for unlimited data is CHEAP, and this is a choice I would suggest to my niece and nephew who are no longer on their parents’ family plan. Additional lines on the Walmart Family Mobile are $34.88 per month. So if all three of us were using Walmart Family Mobile, our pre-tax monthly bill would be a mere $109.64. Because the third line on our current plan is only $10, this turns out to be comparable to what we would be paying on our current family plan if we did not have to make payments on the iPhone. But I wondered how Walmart Family Mobile stacked up against the prices other major companies were charging for their no-contract plans in my area. Sprint is the only other major company that offers you unlimited talk, text and data without a contract. But their price for that is $70 per month. That’s more than DOUBLE what Walmart Family Mobile charges. Verizon offers unlimited talk and text on a month-to-month basis, but not data. You’ll pay $60 per month for 2 GB of data and $70 for 4 GB. AT&T has a similar plan, with $60 per month for 2 GB of data and $70 for 3 GB. 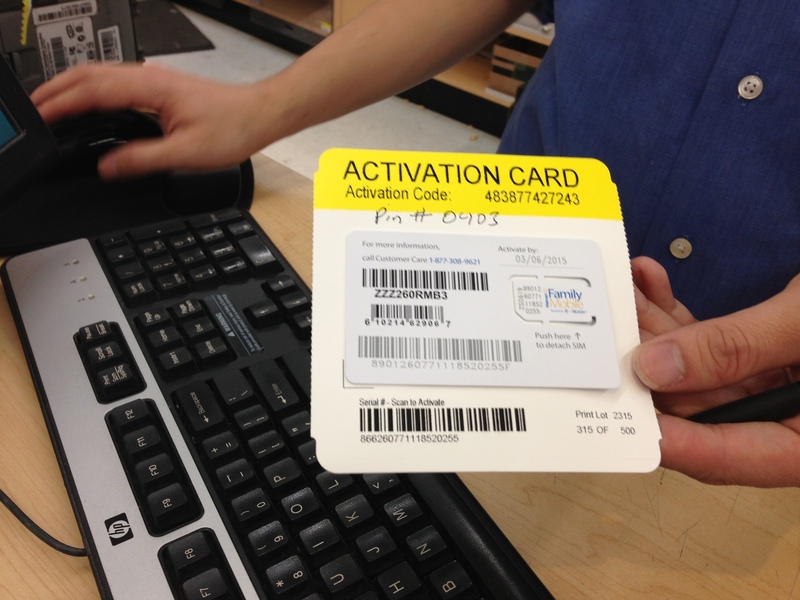 You can choose to activate your phone in-store or at home with the $25 Walmart Family Mobile Starter Kit. Purchasing the myTouch and setting up service at Walmart was super easy. Service is month-to-month, so there’s no need for the credit check required for the major carriers’ contract plans. All you have to do is choose your handset and purchase the additional $25 starter kit to activate service. I opted to do this in-store, but you can also assemble your phone, insert your SIM and activate it yourself at MyFamilyMobile.com. This is also where you can manage your account. I will receive my first month’s bill via text in 16-18 days from when I activated the service with the first monthly payment due a couple of weeks after that. You have the option of visiting MyFamilyMobile.com to make your payments or to authorize AutoPay with a credit card. The Walmart associate who helped me set up my new account was friendly and knowledgeable. One of the reasons we stay with GSM type mobile service is so we can use our phones when we visit my husband’s family in the UK. We own prepaid SIM cards from British carriers for each of our lines — this allows us to communicate with our family and each other over there without getting hit with international roaming fees. But most phones sold in the United States are locked so they only work on one carrier’s network. T-Mobile has always helped us by unlocking our phones for international travel. My Walmart associate assured me I could do that with the new Walmart Family Mobile phone, too. All I have to do is dial 611 and I would receive the same customer service I already enjoy at T-Mobile. 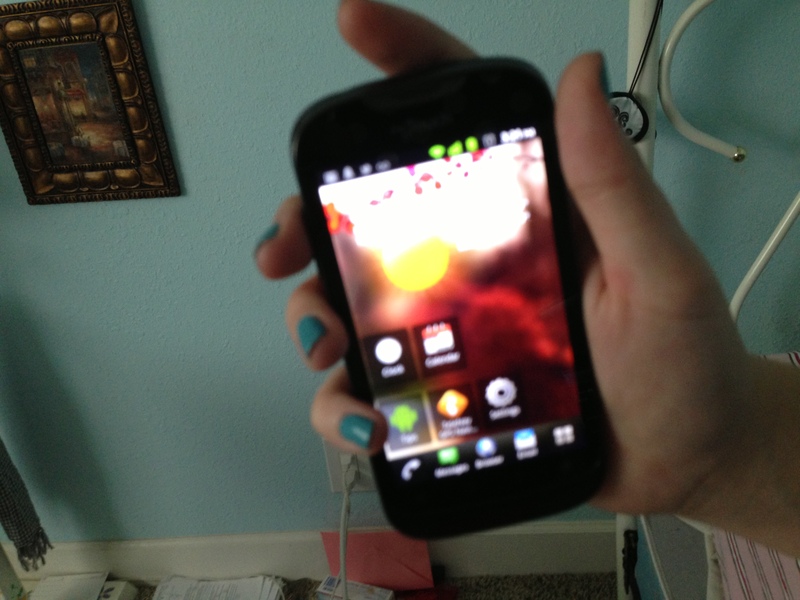 My daughter shows off her NEW myTouch Smartphone. While I was busy setting up our new Walmart Family Mobile account, my daughter was finishing up the last of her back to school shopping. We met outside the store and I handed her the phone. I repeated the advice of the sales associate: The equipment gets charged at the factory, so it’s still got some juice when you take it out of the box. She could use it right away, but should probably give it an hour or two in the charger once we got home. Yes, I told her. You’ve got high speed data on this phone. Yes, I told her. And when you need a quick answer on the Internet, you can use it to browse. You can also access Google Play for an entire library’s worth of apps: from alarm clocks to dictionaries to weather forecasting to photo editing… That’s one of the reasons smartphones are so smart. Nothing, I said. You’ve got an unlimited data plan. I had a feeling she would. I love how affordable Walmart Family Mobile is! I am sure your daughter was THRILLED to have a phone that does so much! She’s so funny, Jen — she’s acting all cool like she doesn’t care one way or the other. But I see her using it (instead of the old phone). And she keeps showing me cool new apps she’s found. So I think she’s pretty happy. Thank you for visiting and leaving a comment! I had a feeling she would end up loving the new phone! I love the Walmart family plan! It has worked out very nicely for us. And I feel better now that she can access the Internet on her phone I know – that’s not what most parents say. But by the time they are high school seniors and have demonstrated the maturity to handle the Internet, it makes as much sense for her to have all the tools at hand that I want for myself.